When students act as problem solvers, engagement in learning increases. If we know this to be true, then why haven’t we involved students directly in creating a solution for the college and career readiness gap in our country? At Hobsons, we have always endeavored to maximize student success, and have done this by enabling school staff with an arsenal of rich tools and services to drive college and career planning. 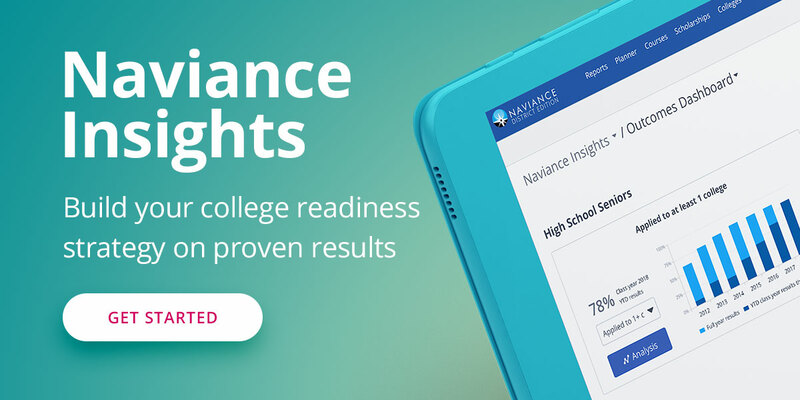 Today, our approach evolves, as we introduce the Naviance College and Career Readiness Curriculum, a blended learning sequence of lessons that enable students with an arsenal of their own. Student-driven and owned, our curriculum provides an engaging experience for students to navigate the college and career readiness ecosystem, beginning with a deep foundation in self-discovery and success habits and culminating in a wealth of college knowledge to enable meaningful post-secondary choices and successful outcomes. Figuring out how to keep students interested in college and career planning was a multi-year process with much trial and error. We worked with hundreds of students all over the country to get it right, testing out different types of content, gamification techniques, design and experience. We needed the students we would serve to validate that the content engaged and motivated them every step of the way. We traveled the country to speak to students about creating a viable post-secondary plan, and what it would take to create its component parts. Our team included curriculum developers, former school counselors, user experience designers, software developers, product managers, and Ph.D. researchers with a focus in human factors. With this team we had those who were focused on the goal of meeting our clients' challenging objectives, working alongside those who could create the experience for students that would engage them. Our theory is students will only provide actionable data to their educators if they understand why they're doing it, and if they can see what's in it for them. See what's possible: In our curriculum, we expose students to stories of college students and young adults who've successfully carved out a path for themselves, even in trying circumstances. We've partnered with Roadtrip Nation to create exclusive video content to spotlight these stories, which many of our pilot students described as inspirational. Develop non-cognitive habits: We weave lessons about the importance of grit and resilience throughout the curriculum, so students recognize that failures and setbacks are an inevitable part of anyone's path, especially successful people. Students reflect on these concepts beginning in 6th grade, when student engagement is still high. Acquire college knowledge: We start the conversation about college early, empowering students with financial aid information, a breakdown of the college application process, an overview of how to prepare for life after high school, and much more. Ownership of path: We believe that a student is more likely to persist in achieving a post-secondary goal when they are behind the steering wheel. Each activity in our curriculum prompts students to answer questions about the concepts taught in each lesson, and are guided to craft a comprehensive plan in which they actively put themselves at the center of the conversation. School staff can review all student activities through our reporting, plan interventions when appropriate, and continue the conversation. Through a pilot program with 11th graders in 6 districts, we gave our curriculum a dry run. The feedback we received from educators and students was invaluable, and directly impacted the development of the curriculum. We spent time with participants at every pilot school site to discuss their response to the curriculum. One pilot student said of their experience, “The lessons really get me thinking about my choices in life, and what I want to be. I would recommend this to anyone who doesn't know what they want to be or what they want to do.” Another told us, “I definitely know more about college and feel a bit more confident about the college application process.” As I sat with groups of students, having qualitative discussions after they completed their activities, it was obvious that a flame was ignited. Students stayed late to continue the conversation about their futures, interacting with our team, their teachers, and each other. When students speak as passionately about their futures as we do about enabling them with our solutions, I can't help but think we're onto something.